Erin and Devon came all the way from Ohio for their intimate wedding ceremony on Clearwater Beach in early June. 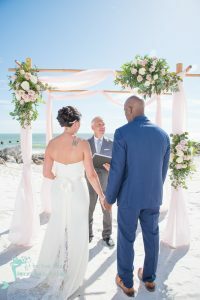 There, with the Gulf of Mexico as their backdrop, and in front of their mothers and two children, the couple shared their vows, exchanged rings, and were pronounced husband and wife by Rev. Rick Lackore of Sensational Ceremonies www.sensationalceremonies.com . Arch, Florals and décor provided by Debra with A Tailored Event http://www.floridabeachweddingsource.com/ ; Travel and Event Arrangements provided by Amy with Adventures by Amy https://www.facebook.com/travelbyamyr/ . Special thanks to A True Love Affair Intimate Florida Weddings https://www.facebook.com/atrueloveaffairweddings , http://www.atruelovewedding.com/ for coordinating the ceremony and Wedding Photographer Tammy Lackore with True Love Photography www.atruelovephotography.com for providing this beautiful photo during their ceremony. Congratulations to the new Mr. and Mrs. Devon Harris!